The word "jet pack" has been around for decades describing a device worn on the back and allowing the user to fly by means of jets of some sort of propellant. James Bond used one in the 1965 film Thunderball. Unfortunately, this science fiction-y invention, probably first made famous by Flash Gordon, has always suffered from a short flight time due to the inability of the flyer to carry a great deal of fuel. In 2000, Raymond Li, a Chinese-born Canadian from St. John's Newfoundland, came up with the idea of a jet pack using water as its propellant. Li did some testing in Canada but moved to Florida to complete his work. A prototype was made in 2008 and Li's company Jetlev launched a commercial version of the product in 2012. From there, it would seem thrill seekers have taken to the jet pack - dare I say it? - like a duck to water. As you can see from the photo (not me), the jet pack consists of a harness with nozzles controlled by two arms. A feeding tube of about thirty feet in length (10 metres) connects the harness to a floating pump which scoops up water and forces it up the tube. The user can change the direction of the nozzles and the amount of thrust to fly forward or backward or turn left or right. My story starts with wading out to a Seadoo piloted by John my instructor. He ferries me to an anchored boat which acts as the launch pad. I am introduced to Captain Ralph who seems to be overseeing the boat and to Will who will apparently be in the water on a Seadoo in case I need any help. I give up wallet and glasses, remove my shirt, and then put on a life vest. John asks me if I got the photo package. The what? They explain that for an extra twenty-five bucks, I get a camera mounted over my right shoulder which films me and the jet pack. In my other (semi-)dangerous stunts, I have always bought whatever photo package offered thinking they can film me better than I can so I say, "Yes." They'll give me a memory card and when I return to shore, I go pay for it. John shows me the jet pack mounted on a stand and gets me to sit down on an attached seat to be strapped in. He runs over the various parts of the pack and how to steer using the arms to control the nozzles. He informs me that I cannot control the thrust as he will do so remotely so as to reserve the ability to kill the power if things got out of hand. As well, I have a strap attached to my right wrist which is connected to my own kill mechanism. If I get into trouble, all I have to do is yank my right arm to pull a rubber stopper from a switch which will immediately cut the power. Last up, John gets me to put on a helmet that has a radio. John can talk to me but I can't talk to him. He'll be constantly giving me instructions as I attempt to fly. Considering the wealth of information I've just been given, radio instructions turn out to be a very very good thing in order to keep me on the straight and narrow. It's a lot to take in all at once. John has emphasized over and over again not to change the nozzle arms abruptly or too much as I will overfly my mark easily. This turns out to be quite true. John asks me to stand up but I need some help to figure out how to balance myself. Once standing, I move to the back of the boat and turn around to carefully step down into the water then fall back. Will is in the water and gives me further instructions. First up is how to turtle. This is simply how to turn over from being face down to floating on your back. The pack, by the way, floats so I'm not going to be dragged down. Will shows me how to attach the rubber plug on the kill switch and explains the red and green lights indicating the status of the machine. Once I'm all attached, I await the green light then press the button to start the pump. John tells me we're going to start slowly. With only a minimal amount of throttle, I practise which amounts to body surfing. He gets me to turn left and right to better understand how moving the nozzle arms and shifting my body affects how I move. After five minutes, he announces he's going to give me a little more throttle and I rise a bit more out of the water. As I understand it, I move around and drag the floating pump behind me. John stresses that it is important to keep moving forward to avoid possibly moving backwards and either getting tangled up in the pump or if flying, actually landing on top of it. Considering I have no idea of what I'm doing and I'm trying to remember each and everything he told me, I am madly trying apply everything to an actual flight and John's radio instructions turn out to be the key to my success. As I get more throttle and I rise more out of the water, I am finding that on occasion I'm moving one way or another either by the pull of the water or by the wind. I'm not really sure but I have the feeling once in a while that I am suddenly pulled left. Of course, it could completely be my fault. I don't know. Ten minutes in, I feel myself tumbling to my left. I hear John telling me not to let the nozzle arm get into the water. Too late. I fall to my left; the nozzle arm goes in the water and I lose control. I immediately let go of the right nozzle arm and yank my arm. The rubber plug comes off the kill switch and the pump immediately stops. I hear John's voice in the helmet, "See? You can't let the arm go in the water." Will is immediately there on the Seadoo. I realise that as I'm flying around, John is monitoring my progress while giving my instructions and Will is staying close on a Seadoo ready to come over to me at a moment's notice. While people may think of this as a so-called dangerous activity, I realise I am being well taken care of. If it truly was dangerous, they wouldn't let me do it! I get the rubber plug back on the kill switch then wait for the red status light to go out leaving the green to go. I press the start switch and I'm back in business. There's more body surfing and more practice turns. John tells me he's going to give me a little more power. I'm now half out of the water. Somehow it feels safer with my feet in the water. It gives me something of a sense of being attached to Mother Earth. John has me move the nozzle arms up and down to better get a sense of moving forward and rising up. He cautions me again for the tenth time to not go backwards. Avoid the pump at all costs! Always move forward. With the level of thrust, I can partially rise up and I can go back to body surfing. I practise this trying to get comfortable with being more out of the water. John is getting me to turn right because I'm favouring turning left for some reason. I chuckle thinking I need more practise to be able to turn in either direction. I turn right then turn left. I come down a bit too close to the water and let my left nozzle arm dig into the water. Oops! I get caught in the water, lose control, and yank my right arm to kill the power. John is in my ear, "Don't let the arm get in the water!" I'm sure I'll remember that after the twentieth time. We get back at it and John gives me even more power. I am now flying completely out of the water. At times, it's a little scary. I am unsure of myself and whether I'm going to maintain my balance but John is voicing approval telling me I'm not doing to badly. Later, I will see a photo taken by a friend from the beach on his iPhone which shows me about fifteen feet (3 metres) out of the water. Woo-hoo, I'm James Bond! A very wet James Bond. John announces that I have another five minutes. Oddly enough, I'm thinking that I've had enough. I do another two trips around the boat then come back down. I get out of the harness as per John's instructions leaving it for Will to bring back in. I swim to the boat and come up the steps. Ta-da! I've done it. I towel off, gather my stuff and then John takes me back to shore. Here's the funny part. When John picked me up, I only had to walk out in water as deep as my knees. I thought he was going to leave me in the same spot. Note that I put my wallet with my I.D. and money plus my sunglasses case in the pocket of my bathing suit. John says good-bye and I step off the Seadoo and sink up to mid-chest in the water. Ha ha. That leaves me with I.D., credit cards, money, and glasses case soaked in salt water. Surprise, surprise! Oh well, it will all dry out. This was an interesting experience. However, I am not going to categorise it as something I would want to do again. I did a tandem parachute jump and it was thrilling. I don't particularly want to do it again. I did the CN Tower EdgeWalk but can't see myself doing it again. It's the same for jet packing. I would advise anybody to try it but I can't quite see anybody becoming enamoured enough with it to want to do it over and over again. Then again, my tandem partner for my parachute jump had actually done it over two thousand times. I guess we are all different when it comes to our adrenaline junkie loves. A couple of thoughts about this. I did not think to bring my camera out to the boat. Could I have asked John my instructor to snap some pictures of me? I did not ask if somebody in my party could have come out to the boat as an observer to snap pictures of me. While I have a 30 minute video from the camera mounted over my right shoulder, I do not have any still pictures of what I went through. A friend snapped a few pictures of me from shore using his iPhone but they are not very detailed and you have no idea that it's me flying around. Having photographic evidence is very important when I sign up for these daredevil stunts. If I live, I want pictures so I can have permanent bragging rights for the rest of my life, all without having to do the stunt a second time. I see no reason to tempt fate. The picture and the video are not of me. FYI: Jetlev is the company which invented this water jet pack. FYI: "Flyboard", made by Zapata Racing, is a similar technology except the nozzles are attached to a small platform on which you stand. Instead of the nozzles thrusting up from the pack at your shoulder level, the nozzles are under your feet pushing your body up. My impression is that a flyboard must be more difficult to master as controlling your balance looks harder. I have not done this... yet. Jet pack, rocket belt, rocket pack and similar names are used for various types of devices, usually worn on the back, that are propelled by jets of escaping gases (or in some cases liquid water) so as to allow a single user to fly. 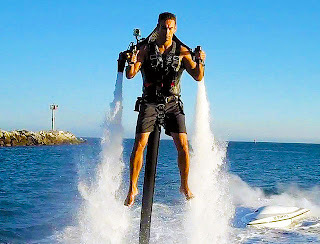 JetLev markets a jetpack which uses water as a propellant and obtains a high pressure water stream from a floating "follower". Top speed is 25 mph, maximum height is 30 ft, range is 80 miles, and duration is 4 hours. The cost is $99,500USD. This is a clip from the James Bond movie where the Bell Rocketbelt is used. I am now leaning backwards at a fifty-five degree angle. Letting go of the support, I hold my arms out and smile for the camera. I look down. The ground is 356 metres or 1,168 feet straight down and the only thing stopping me from an approximate ten second drop to my death is a steel cable my guide assured me could support the weight of an elephant and a half. You get harnessed up; you get instructions; you are hooked in tandem to a professional who has done this a thousand times but as you stand at the door realizing that you are about to jump out of an airplane (13,500 feet or 4,100 meters), there is a voice in the back of your head screaming, "Ah! Noooo!"